Following the new episodes of Luke’s Vietnam on the Cooking Channel, I’ve been watching Chinese Food Made Easy. Ching-He Huang, the cook on the show, makes everything look so fresh, super delicious, and so dang easy. After watching a few episodes of Chinese Food Made Easy, I browsed through the Rasa Malaysia food blog site to find a dish I normally order at restaurants to try to make in my own kitchen. 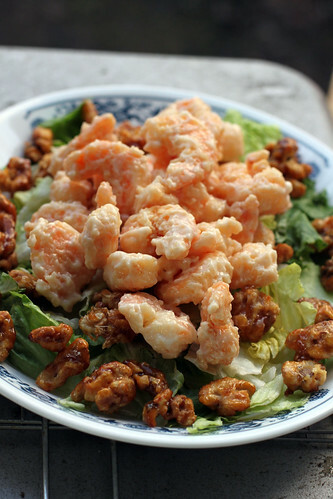 The one dish that caught my attention was Walnut Shrimp/Walnut Prawns. Everybody that likes to eat shrimp loves this dish. Even my sister who doesn’t like seafood loves this dish. She even takes Benadryl before eating this dish just in case she gets a random allergic reaction from eating shrimp. 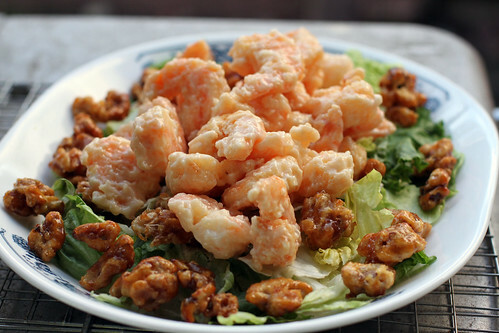 The crispy shrimp in this dish is smothered in smooth creamy sauce goodness and accompanied by candy glazed walnuts. Truly a combination that is out of this world. For some reason when I was making this dish, the melodies of Soul 4 Real’s Candy Rain popped into my head and made me very happy. This dish takes more time to prepare than most Chinese stir-fry, but it is totally worth it. Go impress your family, friends, and significant other! 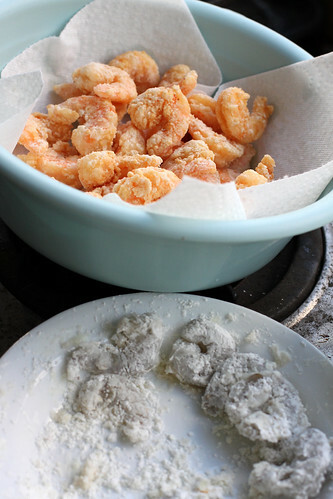 It doesn’t cost much to make and the recipe below fed about 6 adults with just one frozen bag of shrimp. The amount of creamy sauce I prepared below for the 1.5 pounds of shrimp in this recipe is the same amount Rasa Malaysia used for 1 pound of shrimp. I don’t like my shrimp smothered in creamy sauce, but if you do, feel free to add a little more of everything to your creamy sauce! 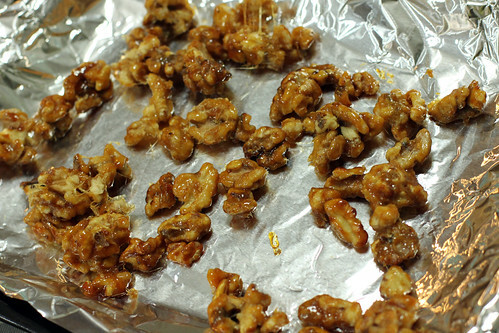 To make glazed walnuts – bring water and sugar to boil in a small saucepan, reduce liquid until it turns brownish golden caramel color, add walnuts to the saucepan, mix walnuts in caramel sauce, and place walnuts on foil or cookie tray. To make creamy sauce – combine and mix mayonnaise, honey, condensed milk, lemon zest, and lemon juice in a small bowl. 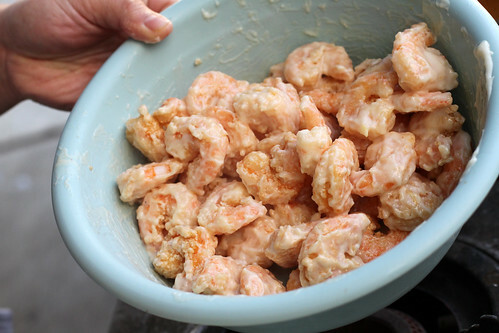 Thaw, peel, devein, pat dry shrimp and put in a mixing bowl. 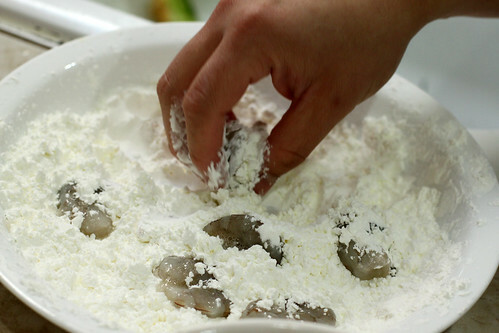 Add egg white and a little bit of salt to the mixing bowl and coat the shrimp evenly. Dip and coat each shrimp in a nice layer of corn starch. 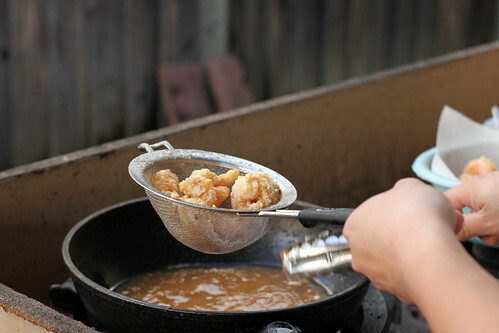 Heat up oil in a Wok (or any preferred frying equipment), fry shrimp in batches, and drain on paper towel. 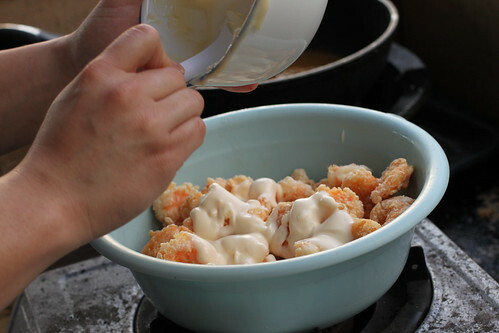 Combine shrimp and creamy sauce in a mixing bowl and toss until each shrimp is coated with the rich and delicious creamy sauce. Note: I don’t like to buy shrimp that is already peeled and deveined. It is usually very salty and doesn’t taste very good. I suggest that you peel an devein the shrimp at home!